Preheat the oven to 160C/gas mark 3. Grease and line a baking tin, about 20cm square. Put the butter, sugar, peanut butter, honey and grated citrus zests in a deep saucepan over a very low heat. Leave until melted, stirring from time to time. Scatter the remaining seeds over the surface and trickle with a little more honey. Bake for about 30 minutes, until golden in the centre and golden-brown at the edges. Leave to cool completely in the tin (be patient – it cuts much better when cold), then turn out and cut into squares with a sharp knife. These bars will keep for 5-7 days in an airtight tin. These bars are really very moreish and you only need a small piece to fill you up. The fruit I used was mainly raisins with some dried cranberries and dried apricots. I used a mixture of smooth, crunchy and three nut peanut butter, because that's what I had in the house. The peanut butter doesn't dominate the taste of the bars and they are the soft and fudgy type of flapjack rather than the crisp, crunchy type. I'm entering the flapjacks for Tea Time Treats, the monthly blog challenge run by Karen at Lavender and Lovage and Janie at The Hedgecombers. July's Tea Time Treats is being hosted at The Hedgecombers. These look very tasty and wholesome Janice! Oh yummy! LOVE bars like this Janice, and packed with so much good stuff too. Like you I've always a stock of nuts, seeds, oats and dried fruits! A FABULOUS tea time treat Janice and one that I would be happy noshing in morning, noon or night! These are prefect for my household as we eat a lot of oats, seeds and dried fruit plus all adore peanut butter. Won't last 5 minutes. I guess that is the idea. 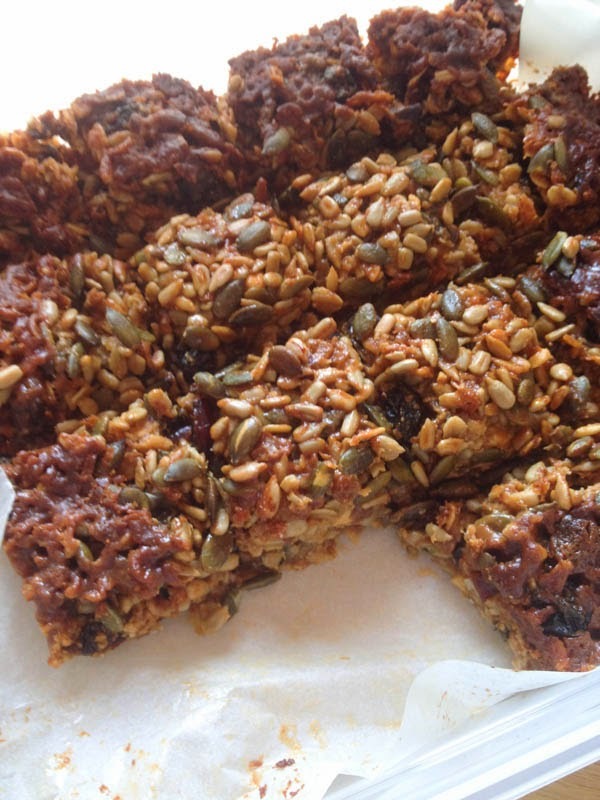 I'm a big flapjack fan, these look lovely and they seem to keep well too! I would like to try these with almond butter. Like the addition of seeds. If you could whip me up a batch now I'd be happy! They certainly fill you up, Stuart. Lol, you could whip up a batch yoursef, I've already eaten too many of them. Let me know how you get on Sisley. Almond Butter would be lovely, I did you some Whole Earth 3 Nut butter at part of the mix, I was clearing out half empty jars for the others! Thanks Fiona, they do keep well, but don't last long! Thanks Madeleine, I managed to keep them for about a week, but that's with no kids in the house and strict rationing lol! Yes, I like a nice deep bar and they are nice and chewy. Thanks Alison, they are perfect with tea or coffee. Glad to hear that Karen, I'll certainly be making them again. Thanks Lou, they would be easy for kids to make too. Honey and peanut butter. Hello! I love flapjack but I've never tried them with peanut butter, sounds delicious. Fab! I only ever add flax seeds, but I now think I should add more.